Unsettles defences with his pace and power and is versatile enough to be an option down the left flank. But his critics say his strike rate is not good enough for an international, and his form has been erratic in recent times. 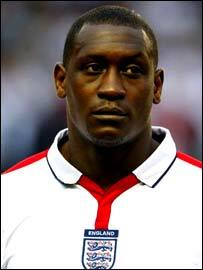 Heskey consistently found himself down the pecking order at Liverpool before a £3.5m move to Birmingham City in May, where he will hope to rediscover his goalscoring touch. His recent England form has been indifferent too, and he needs to produce for Sven-Goran Eriksson to continue picking him in the squad.